Located in the 1st Arrondissement of Paris you will find the Eglise Saint-Roch, and we took these high definition photos showing a bas relief sculpture inside the church called Jesus Portant sa Croix, which was produced by Louis Pierre Deseine. 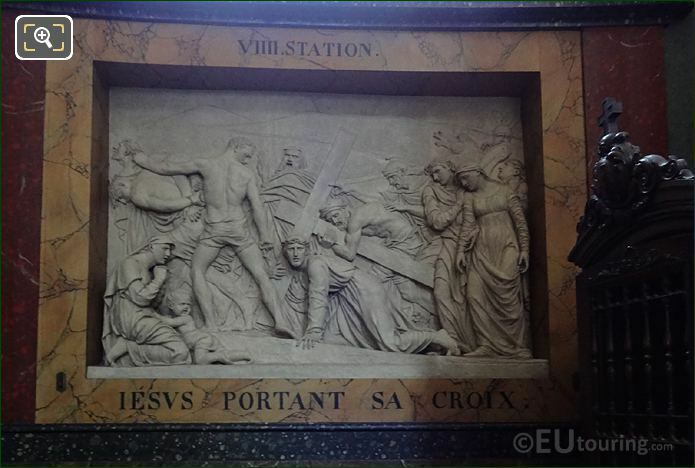 This first HD photo shows a bas relief, or in English a low relief, called Jesus Portant sa Croix, and again in English this translates to Jesus Carrying His Cross, which is a scene taken from the Bible mentioned within Saint Matthieu, and made of plaster, this was sculpted in 1805. 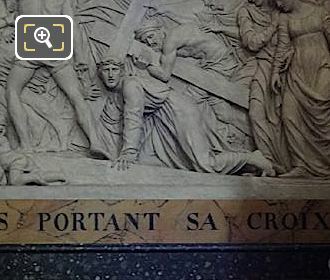 So here you can see the title of the sculpture, Jesus Portant Sa Croix, which was produced by Louis Pierre Deseine, who was born in Paris in 1749 and studied under Edme Dumont, winning the Prix de Rome 1780, which meant he could further his studies and career at the French Academy in Rome. Upon his return from Italy, Louis Pierre Deseine received many commissions from the Bourbon family and received a title of Sculptor of the Prince de Conde, producing several busts of the royal family and other important French figures, plus he produced six of these reliefs for the Eglise Saint-Roch, along with working on commissions for other tourist attractions. 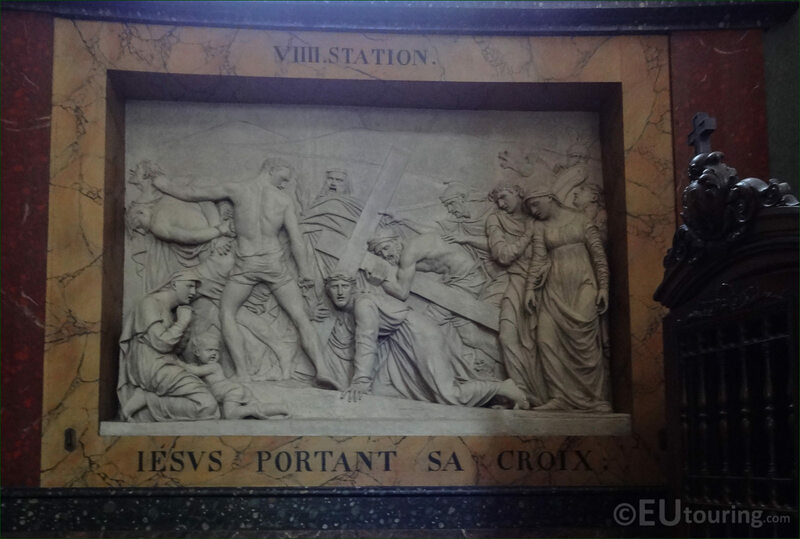 Yet this photograph shows the name on the frame of the bas relief depicting a scene called Jesus Carrying His Cross, which is known as a Station of the Cross, also sometimes referred to as a a Station of Christ, and as you can see from the Roman numerals, this is the 9th Station. And when you have entered the Eglise Saint-Roch from the entrance on the Rue Saint Honore, this particular low relief sculpture is located within the Chapelle Sainte Marie-Madeleine, which translates to the Saint Mary of Magdala Chapel, and this is on the right hand side in the deambulatory area past the transept.